Dimensions: 6-1/2 x 6-1/2 in. 108 pages. b/w illustrations throughout. Hardcover. Celebrated comic artist and graphic novelist Jeffrey Brown's collection of all-new drawings sweetly illustrates the joys of living with a cat. 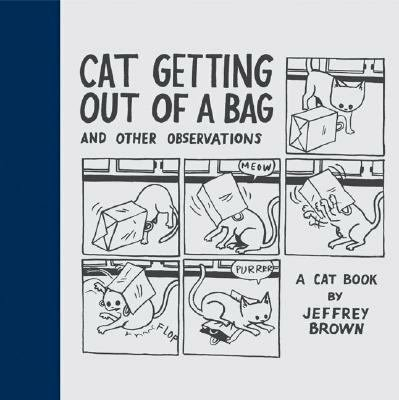 Featured in McSweeney's and on NPR's This American Life, and praised by comic luminaries Chris Ware and Daniel Clowes, Brown's work has always paid tribute to felines as they curl up on couches and purr on the peripheries of his autobiographical stories. Cat Getting Out of a Bag follows his cat Misty really, any cat as she goes about her everyday activities and adventures. In a series of drawings, Brown perfectly captures the universal charm of cats in a lovely book sure to please fans and cat lovers of any stripe.